I was born on 14th January 1930. Celtic Park was a 30 minute walk from my Cinnamond Street home in the Pound Loney district of West Belfast. I can remember walking to the ground, up the Falls Road, behind Jackie Vernon, the Celtic captain. A number of players used to walk to the ground on match days. I can also remember seeing Charlie Tully stepping out with his girlfriend after a match, when I was with a group of my friends. We called out to him, “Hello Charlie,” to which he responded, “Hello boys, how did I play today?” We shouted back to him, “You played well Charlie”. He was a very friendly man. I used to go along to all the home games with my friends and we even got to some away games too at Linfield, Glentoran, Lurgan, Distillery, Cliftonville and Glenavon (where Jimmy Jones came from). We personally never experienced problems at Linfield or Glentoran. However, we heard from other supporters about trouble at away games. They said Glentoran fans would draw a chalk line down the back of Belfast Celtic supporters which would enable the home crowd to identify the away supporters in order to give them a good beating after the game. I can remember asking older supporters to lift me over the turnstiles at home games when I was a wee lad. I made sure I vanished into the crowd straightaway in order not to be caught by the man collecting the entrance money. When I was older I could clamber up and over the gate by myself. We were a poor family and there was no money for luxuries like football matches. Belfast Celtic had a great team and won lots of trophies in my time. They would even play Glasgow Celtic in friendly matches. I can even remember them beating Scotland on tour in the USA. Unfortunately they disbanded when I reached the age of 19. Four players went to Fulham: Hughie Kelly, Robin Lawler, Jimmy Jones and Johnnie Campbell. Bud Aherne went to Luton. Jackie Vernon went to West Brom (I managed to see him play when I was living in Birmingham). Charlie Tully went to Glasgow Celtic where he was loved by the supporters. They called him ’Cheeky Charlie’. He would beat a man, take the ball back, then beat him again! 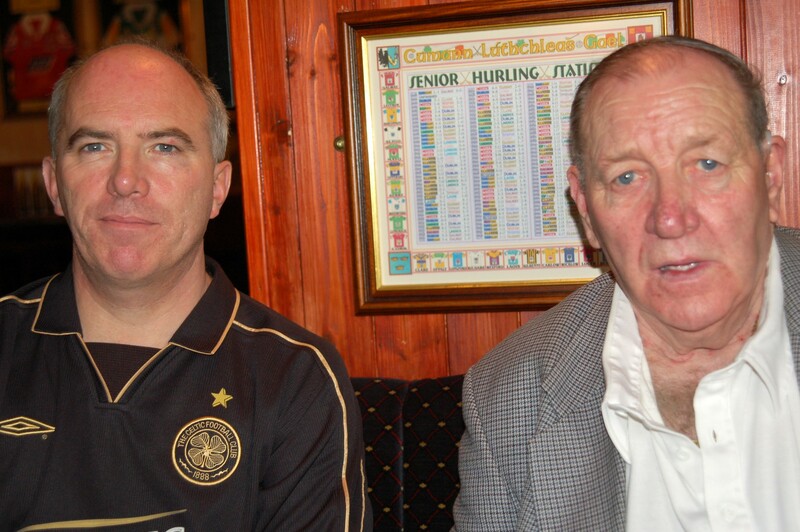 One memorable game featured Charlie Tully scoring three times directly from corners. He scored from the first but the ref disallowed the second as he said it was impossible to do it twice. Possibly the ref was unsighted? Charlie had to retake the corner and, of course, he scored for the third time. What a player he was! I played for a good West Belfast club called Rose Bank between 1950-52. We won the Gibson Cup in 1952 with the final being played at Cliftonville’s ground. Unfortunately I cannot remember who we beat in the final. Watching the cream of Belfast Celtic as a boy, football became my first love. And I played whenever and wherever I could. After a brief time living in Birmingham, I moved to Penge in South East London. I was invited to join the local team, Cator Park FC. I was proud to captain the team and we were league champions in the Beckenham League in the mid 1950s.The team included some real characters. Forgive me if I get the spellings wrong - it was a long time ago now. I am centre with the ball at my feet. Terry Tompkins, to my left and Bobby Whitten to my right, were both fierce competitors. 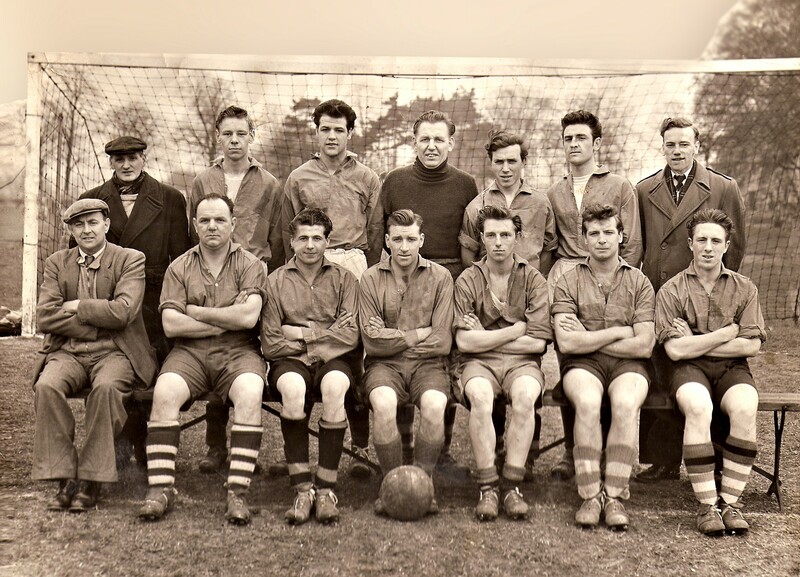 Paddy King was a Cork man (first from left, front row) and standing behind him was the manager, Walley. And Phil Everett was an ex-army man who played left back (second from left, front row). We also had a Kiwi in the team (back row, second from right) although his name escapes me now. All the lads in the team gave their all on the pitch and it was a privilege to play along side them. Tommy Carabine (with ball) Captaining Cator Park FC, Penge (1956). We were all disappointed when Belfast Celtic closed down. They were in contention to win the league when they were playing Linfield at Windsor Park. After the game, home supporters turned on the Celtic players. Jimmy Jones, a Protestant, was attacked and beaten up. His leg was broken which left one leg shorter than the other. Strangely enough, he played better after the injury. The club decided to disband after that as they could no longer stomach the sectarian violence. Many Belfast Celtic fans turned to Cliftonville after the demise of Belfast Celtic. There is often trouble to this day at Linfield v Cliftonville games. Times were hard then. Me and my friends would make a cloth ball out of old socks and play football in the forecourt of the Belfast Celtic ground on match days. We got very excited and were deliriously happy as we entered the ground and went up the steps to see the full splendour of the pitch. I still read the numerous books on Belfast Celtic and I am very happy that there is a revival of interest in such a great club. My son, John, has ordered me a Belfast Celtic shirt which I will wear with pride when it arrives. Hail Hail!